All trains have axle boxes in which there are metal bearings either of the friction type or the roller type. These bear the weight of the train and allow the axle to turn freely, but if they are not kept well maintained they will wear and become hot. This heat will lead to smoke, distortion and in extreme cases the axle box seizing up with potentially disastrous consequences. 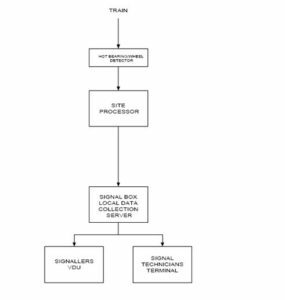 The correct selection of a site for the position of a hot axle box detection system is all-important for efficient, reliable performance of the system. The following criteria must be considered before making a decision on the location. Far enough from freight yards and terminal stations to ensure adequate train speed to allow time for problems to become apparent, that is to say that axle boxes must have time to reach normal operational temperatures. Sited where a defective train may subsequently be stopped and inspected, at a controlled signal with access to a siding or loop. Not sited on an extensive downhill gradient where braking is required, to avoid the raising of false alarms. Not sited on curves as more pressure is exerted on an axle on the outside of a curve. Once an appropriate site is selected a system is needed to provide the detection. Any hot object radiates energy in the form of heat, which is in fact a form of electromagnetic radiation similar to light and radio waves. The particular wavelengths associated with heat are close to the red light end of the visible spectrum and so this heat radiation is called infrared. To detect the temperature of an object accurately, we have to know something about the amount of energy that will be dissipated by the object, this depends on two things the temperature and the materials used in the construction of the object. We know the materials used to construct axle boxes therefore we can readily determine the temperature by the amount of infrared radiation emitted. The systems used to detect hot axles need to be able to measure the amount of infrared energy emitted by the axle box. The detector is positioned at the focal point of an optical system that concentrates the infrared energy emitted by the axle box. The detector also measures the ambient temperature within the detector assembly to prevent false readings due to ambient changes. We are only interested in measuring the temperature of the axle box and not that of the whole underside of the train. To do this we use an optical system to focus the infrared energy emitted by a small area of the axle box. The detector will accept all infrared frequency equally so two filters are incorporated into the optical system to prevent any infrared frequency outside the range of the axle box from reaching the detector. The arrangement of lens, filters and detectors is fitted into a robust case, which is mounted one on either side of the track, to look at the two axle boxes on the same axle. They are firmly mounted so that the optical system always looks at the same point on the axle box of each train as it passes the installation. 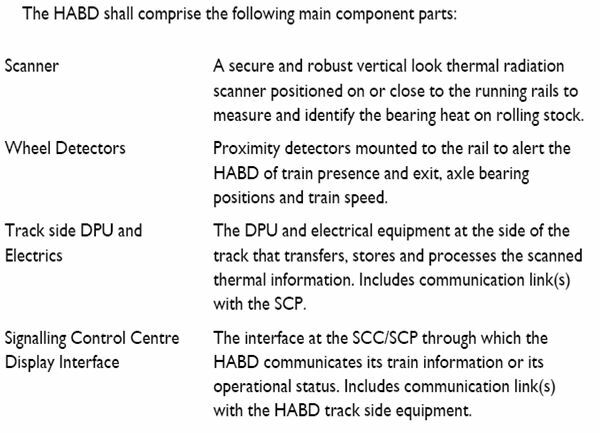 Due to the method of collection of infrared energy the detector needs to be switched on only when it is appropriate to monitor a passing axle box. If this is not done for a large amount of time the detector will be looking directly at the sky and receiving unwanted energy and also at the underside of passing trains which carry exhaust pipes and other hot items which we do not require to monitor. 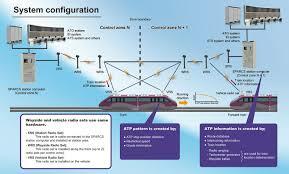 To achieve this selection devices are fitted to the rail that detects the presence of train wheel flanges. Two are fitted close together positioned so that whilst the wheel is between them the detector will be looking at the axle boxes on either end of the axle. It is also necessary to prime the system to allow for the approach of the train. To do this additional devices are fitted on the approach to the site. 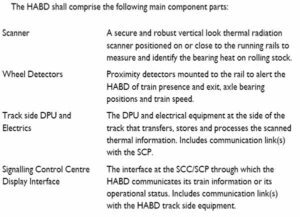 If there is a requirement to detect trains passing in both directions over the site additional devices are fitted for the reverse direction moves. The inputs from the site have to be processed and then the information sent to the signal box. 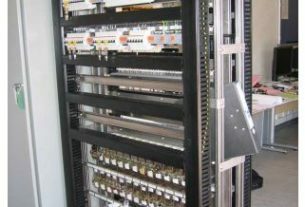 To do this an electronic unit is installed next to the track at the installation. As a train passes the installation the information received from site is processed and a report is sent to the signal box contain a wheel count and any alarm generated. After the passage of each train the system automatically tests itself to make sure it is working correctly but no message is sent to the signal box from the test unless a fault is detected. It is possible for a maintenance technician to start this site test at any time (except when a train is present passing the site) to make sure the system is working correctly after maintenance or for fault investigation. 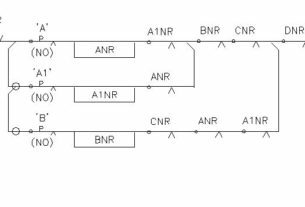 At the signal box the receiver interprets the received input from site to produce a count of the number of axles on the train and indicates if any alarms were received for any axle. The system will send an alarm to the signal box if the temperature of either axle box is over an absolute maximum temperature or if one axle box is significantly hotter than the other. If an alarm was received an audible and visible warning is activated to alert the signalman who can then establish the position in the train of the alarms. The signalman then reacts to these alarms and displays as appropriate for the occasion. Those that assist in detecting infrastructure failure thereby enabling minimising delays to traffic with the purpose of avoiding financial penalty. 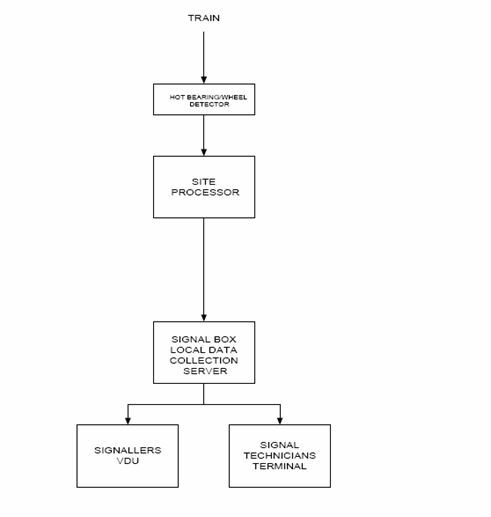 Defects that can have an immediate effect on traffic operation are generally reported direct to the controlling signal box to enable the signalman to take action. Detection equipment read-outs that tend to be located in the signal box are HABDs, bridge bash indicators and possibly bridge scour indicators. Bridge bash indicators are used to detect impacts generally on under-bridges that have a history/high risk of a road vehicle colliding with the supporting structures. Bridge scour indicators are attached to the under-water bridge supporting structures and are effectively buried in the gravel bed and detect when this bed gets washed away. 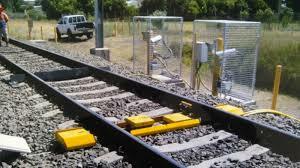 Other detection systems are used to detect wheel flats by using rail mounted wheel impact systems and pantograph problems using pantograph impact load systems. Wind monitoring is also used to impose speed restrictions on traffic, especially on high-speed lines. Read-outs for these would be at traffic control so that warnings can be disseminated accordingly.